The Rath Yatra festival in Puri is the only occasion when non-Hindu devotees, who aren’t allowed inside the temple, can get their glimpse of the deities. A mere glimpse of Lord Jagannath on the chariot, or even to touch the chariot, is considered to be very auspicious. It makes millions of people to come during June and July of every year to spend a religious holiday at this tiny city of Indian state Odisha. The massive number of devotees that flock to the festival does pose a safety risk. Lives are often lost in the immense crowd, so extra care should be taken. To be in safe side here we are suggesting you to book your hotel in Puri on advance basis. Go for good hotels. If you have booked early in advance then you will get minimum price for your accommodation and expenditure. The best hotels and resorts are providing wide range of Puri Rath Yatra tour packages, so that instead of facing rush, crowd and being lost, better to be with hotel management, where the staff will arrange everything as per wish and let you enjoy a hassle free Rath Yatra. One of such resorts in Toshali Sands, situated on Marine Drive road provides best service and hospitality to its guests. Here are important dates to book your Rath Yatra programs according to that. Sri Gundicha: July 14. Placement of the deities in the chariots and journey to Gundicha Temple. 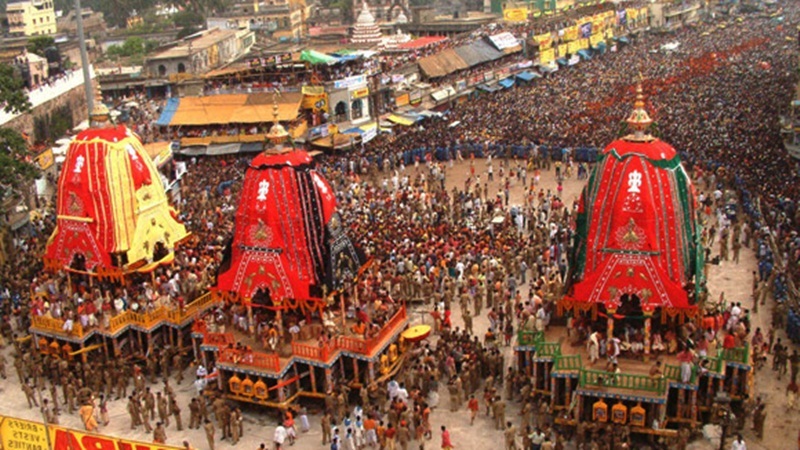 The first chariot to move is that of Lord Balabhadra. Next is Subhadra’s, and last Lord Jagannath’s. Hera Panchami: July 17. Goddess Lakshmi, the wife of Lord Jagannath, gets concerned because he hasn’t come back. Irritated, she goes to Gundicha Temple to find him and see what’s going on. Bahuda Yatra: July 22. The grand return journey to the Lion’s Gate entrance of Jagannath Temple. The chariots are drawn in reverse order. SunaBesha: July 23. Decoration of the deities in gold ornaments. (This is a particularly popular ritual). AdharaPana: July 24. Offering the deities a healthy support drink. NiladriBijay: July 26. Deities are placed back inside Jagannath Temple. Book your Puri Rath Yatra tour package at Toshali Sands and enjoy a great holiday within 100% spirituality and relaxation under supreme luxury.